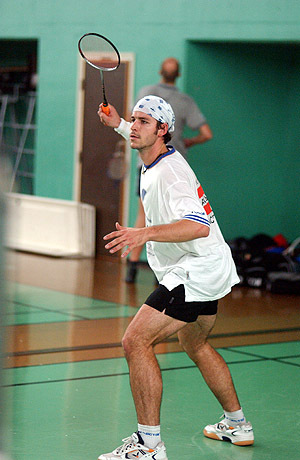 Although multi-racket sport traditions in various forms have been detected in many countries around the world true racketlon, as the IRF define it ("same four sports, same opponent, every rally counts" - see the definition of racketlon in the official rules), is only known to have existed in three countries before Gothenburg 2001 when international racketlon began; Austria is one of them (beside Finland and Sweden). According to this history (.doc, German only) provided by Austrian racketlon pioneer Christian Petz the first Austrian racketlon tournament took place in 1994 after some initial activities containing only three sports (table tennis excluded). Since then tournaments have been organised continuously. Until recently it was not called racketlon but "Racket Vierkampf" but it was, nevertheless, no doubt racketlon as the IRF define it. It is unclear whether the format was exported from Sweden in the beginning of the Nineties or if it emerged independently in Austria. However, Swedish racketlon pioneer Peter Landberg has told Racketlon.com that he recalls an Austrian player taking part in Stockholm during the early days - and, given the fact that the traditional Austrian rules said that victories in 3 out of 4 sports were enough to win the match, which was also the case in Sweden in the early days(! ), the "Swedish export" theory seems likely. If you know who this Austrian racketlon importer might have been please give Racketlon.com a tip on info@racketlon.com ! As Austria linked up with the international racketlon community and became members of the IRF only a few months after its foundation in September 2002 developments have caught on. Powered by an individual (Marcel Weigl, see player profile) of almost unparalleled racketlon ambitions and the hosting of the two latest racketlon world championships (2004 and 2005) Austria has quickly moved up to become one of the strongest and most dynamic racketlon nations in the world, as shown by e.g. no less than 3 Austrians among the Top 13 on the men's world ranking (10 Dickert, 11 Krenn, 13 Weigl, as of 2006-01-15). As a consequence of the impressive achievements of Racketlon Federation Austria (see their homepage on www.racketlon.at) under the lead of Weigl, he was elected President of the IRF in October 2005. In the Word Document linked below he tells the Austrian story of the last few years and outlines his visions of the future for international racketlon. New IRF President Marcel Weigl. "The world-wide expansion of racketlon." Next article in this "State of Racketlon" series coming up within the next few days: Holland - the new star on the racketlon sky?. Stay tuned to Racketlon.com!